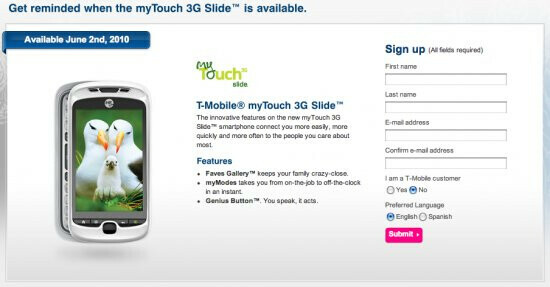 In a move to lessen the wait between now and the time when the T-Mobile myTouch 3G Slide launches, T-Mobile is now offering pre-orders for the handset through its stores. Expected to become readily available for purchase on June 2nd for $179.99 with a 2-year contract, you can guarantee yourself a handset by jumping on board with a pre-order. Once your set with that, all you'll need to do between now and the day you pick it up is to start saving some much needed cash to pay for it – just as a reminder, the handset will be priced at $179.99 after a $50 mail-in-rebate. So if you've finally made up your mind on checking out the Android 2.1 powered T-Mobile myTouch 3G Slide, you'd better hurry and visit a local retail store as soon as possible.